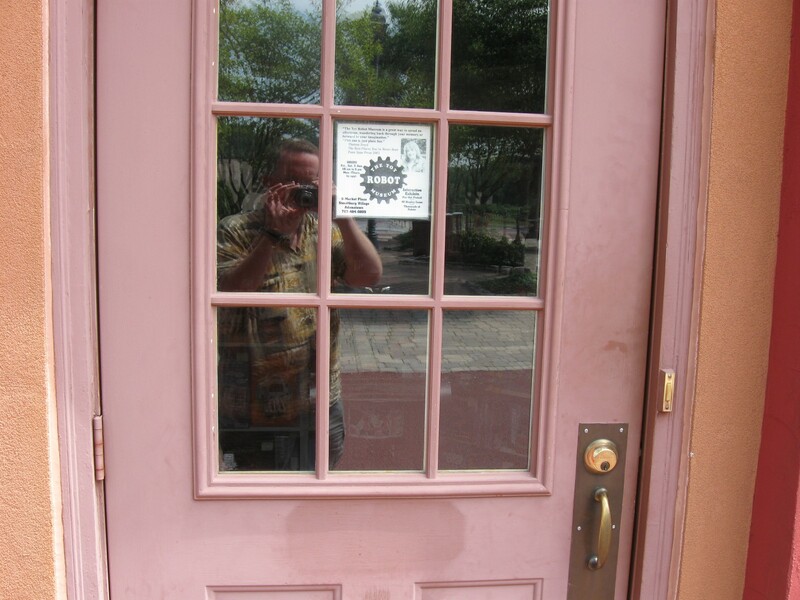 Our 2010 Road Trip, Part 3: Community off the Turnpike « Midlife Crisis Crossover! If only we’d thought to rent a semi so we could tow along hundreds more of these for our turnpike tolls. Fun fact we learned in 2010: Pennsylvania is really, really, really long. Not as long as South Dakota had been in 2009, but long enough to instill déjà vu. We approached from the west; our target Philadelphia was on its east end. The Pennsylvania Turnpike helps the trip go by faster like magic…but magic comes with a price. Fortunately we saved a little money with every digression that lured us away from the Turnpike. DAY TWO: Tuesday, July 20th. Our hotel breakfast in Bentleyville was free, continental, and tiny. While snacking, we perused a copy of the local paper, the Washington Observer-Reporter, dedicated enough to its community that it printed a weekly summary of all local arrests and convictions, including a detailed list of all charges. They seemed to be in the midst of a gun permit fraud epidemic. The most notable crime of the week was a collaborative theft of cobalt and nickel by two or more individuals who failed at getting away with it. We stopped for gas, for Cini-Minis at Burger King, and for an ATM refill, the latter at just the right time so we could return a previous customer’s forgotten ATM card to her. We rejoined I-70 and transitioned to I-76 and on to the Pennsylvania Turnpike, which would drain us of much funding and patience over the course of the week. Our tolls paid for a few value-added sights. The Turnpike took us under four (!) different mighty peaks: Allegheny Mountain, Tuscarora Mountain, Kittatiny Mountain, and Blue Mountain. 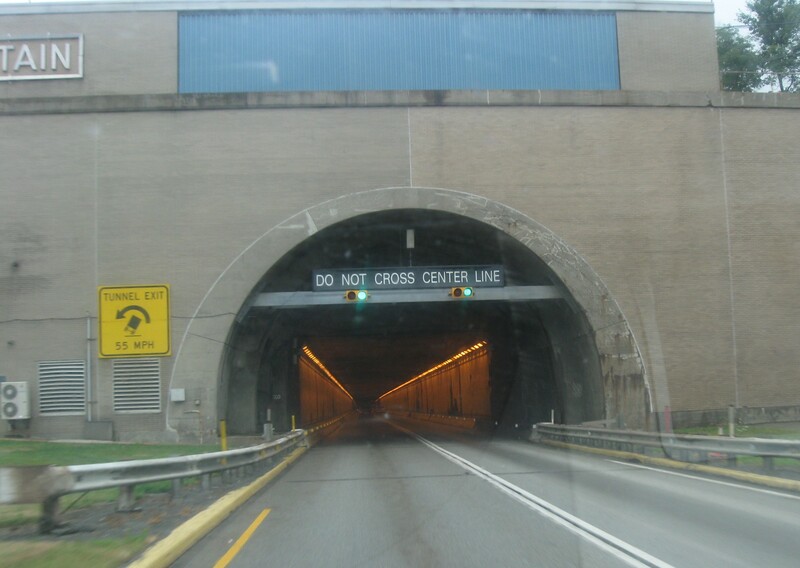 The entrance beneath Allegheny Mountain, beckoning to me. 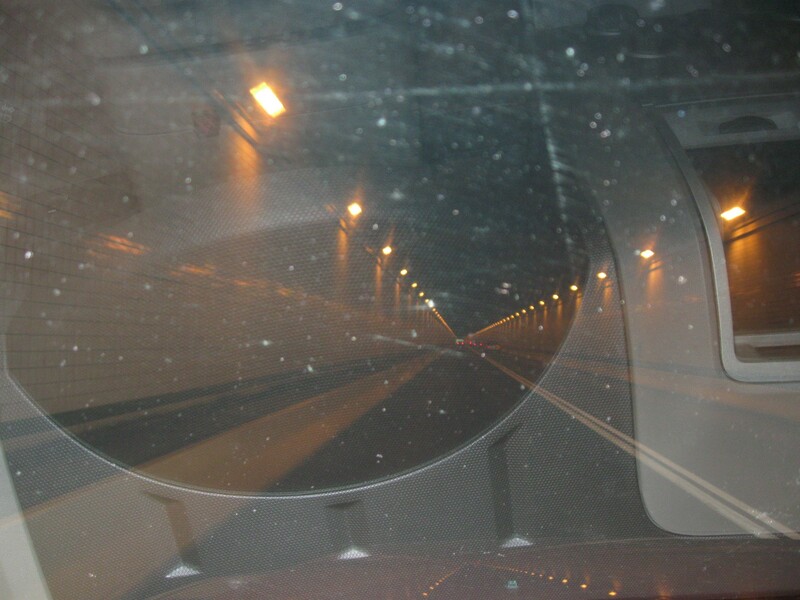 Inside the tunnel, viewed through the past few hundred miles’ worth of flying insect guts. I could’ve tried for a better inner tunnel pic through my open side window, but Anne was already uncomfortable with me driving and shooting. She was just waiting for the day to turn into The Bourne Supremacy, Ronin, The Dark Knight, or any other film that defames the pleasure of speeding through dark tunnels. The highlight of Highway 30 was a town called Everett. 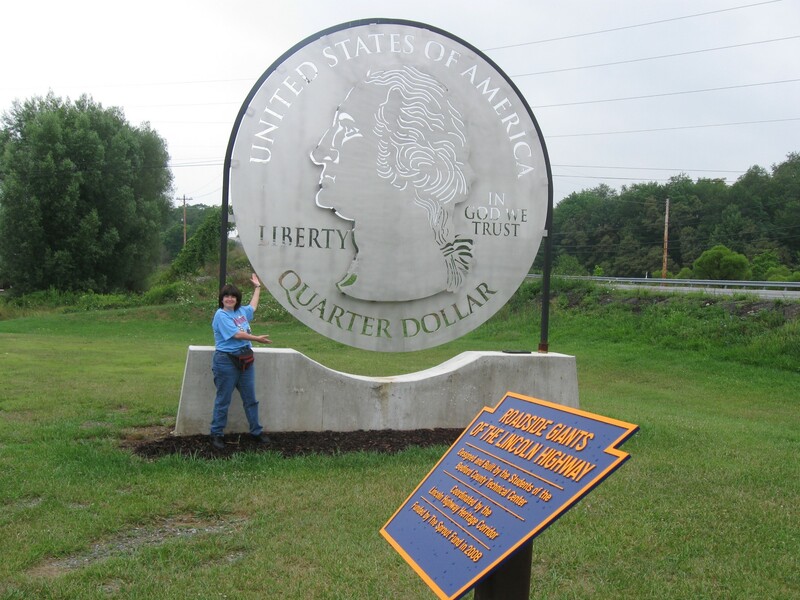 Their main attraction was the giant quarter in our lead photo, the community’s official entry into a local nonprofit competition called the Roadside Giants Project. It stood in front of a golf course parking lot to remind members to tip their caddy. Not far down the road: an ice cream shop shaped like a sundae. Some towns take good care of their roadsides and the passersby who loiter on them. Sadly, we arrived a few minutes before they opened, so we have no idea whether or not their ice cream is worth the detour. The later, twistier turns of Highway 30 were decorated with signs that insisted, “AGGRESSIVE DRIVER HIGH CRASH AREA.” By that time I was sick and tired of Pennsylvania trying to shove omens down my throat, but I minded my driving anyway. The last thing I needed to see on vacation was Anne yelling at me, “I told you so!” from an ambulance stretcher. Eventually the highway took us back to the Turnpike. Lunch was at a turnpike rest stop in Plainfield whose anchor restaurants were a Pizzeria Uno and a Roy Rogers. Uno couldn’t keep up on pizza demand, and we’d never been to a Roy Rogers, so the latter won. One lukewarm generic fast-food meal later, I wished I’d been more patient with the Unoans. Adding discomfort to distaste, a bus pulled up shortly after we did and flooded the place with members of a large teen church choir. I appreciated that they were polite and accommodating to us, unlike the shifty-eyed truckers we’d shared dining space with back in Bentleyville. The architecture screams “polka party”. In Adamstown “quaint” meant “hard to find” and “charming” meant “open only on weekends”. It took two passes back and forth through town before we found the Village. The storefront we sought was the Toy Robot Museum, but its CLOSED sign let us know that days not beginning with ‘S’ were bad for them. A combination of signage and tinting prevented me from taking any interesting photos through their windows. I tried. Just for You, the Viewers at Home. Not much further down the Turnpike was Exton, where we’d be staying for the next four nights at a hotel half an hour outside Philadelphia. The latter portion of our evening had already been reserved for specific plans, but we had a few hours till then. Anne longed to spend the intervening time on something tourism-esque, but to her dismay I first had to spend some time nailing down all the night’s details. Some use was made of the phone, several maps were reexamined, a few brochures and pamphlets were dissected, and — in a rare use of Internet, which we usually strenuously avoided on vacation — half an hour was spent using my son’s Sony PSP to tap into our hotel’s WiFi connection so we could retrieve a vital online message. One eternity later, our evening schedule was more fully clarified, so I at last acquiesced to Anne’s wish to see Philly someday before we all died. We arrived in the city limits just in time for rush hour and took nearly twice as long as we should have to reach the Center City district, where our American forefathers considerately planted all the meaningful historical sites for future generations of would-be gawkers like us. Based on our driving time, arrival time, approximate return trip time, and our 7 p.m. appointment, we calculated that we now had about a fifteen-minute comfort zone for sightseeing to Anne’s heart’s content. We had just enough time to walk a lap around the Independence Hall Visitor Center, use the bathroom, glance at all the major attractions across every street from us, and pose with a local businessman before returning to the car. 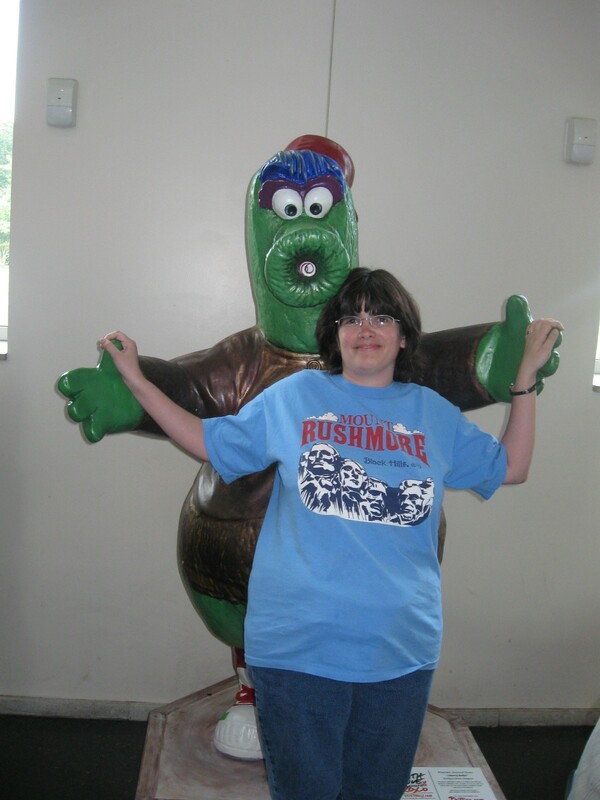 Anne with a statue of the Philly Phanatic, official mascot of the Philadelphia Phillies. We’re not sports fans, but still: tourism! I rationalized the too-short detour as much-needed firsthand reconnaissance, because now I had a more vivid mental picture of where everything was. Anne considered it a fail — if not a true epic fail, then at least a sonnet fail. I’d call it at worst a limerick fail. We then spent more quality time trapped inside rush hour, inching down the two-lane interstate that connects the bustling Center City to the Pennsylvania Turnpike. I don’t get how a city with twice the population of Indianapolis can function with interstates half the size of ours. Much stubborn stop-and-go inching brought us back to Exton, followed by more searching in vain for a particular restaurant, followed by returning to the hotel so we could make a phone call, followed by driving a couple extra blocks because I simply hadn’t driven far enough. We were late, but we found our company — a good friend from our longtime message-board home, graciously meeting us for dinner. She was among the 20+ fellow members who’d traveled to Indianapolis for Star Wars Celebration III in 2005, so we couldn’t possibly pass up the chance for a reunion. We met at a restaurant called Han Dynasty, much nicer and more elegant than the Chinese buffets we’ve stopped frequenting back home. Surprisingly, we discussed more than just the internet or Star Wars. Most of us enjoyed our dinner. My Eggplant Casserole with Garlic was just fine, though our friend’s Kung Pao Tofu looked interesting. 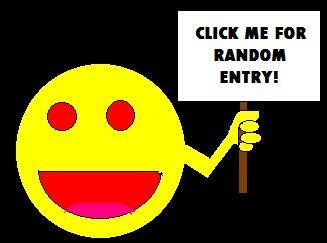 I don’t mean “interesting” to sound ironic. I make no secret of my carnivorous ways, but I’ve had tofu before and don’t mind it. I rarely notice it as a menu option back home, though. Anne played it safe and stuck with Sesame Chicken, no worries allowed. My son was disappointed that their extensive menu didn’t offer any teriyaki items because this wasn’t that kind of Chinese restaurant. Instead he ordered Three-Cup Chicken based on its benign photograph. Little did he know that the finely cooked chicken served to him in its cooking pot belied a minefield of bones and toothpicks. He tore into it as valiantly as possible, trying not to complain in front of company, but surrendered when the poking and the stabbing overwhelmed him. Apparently because our conversation wasn’t interesting enough to eavesdrop on, or maybe because it was a slow night, the owner of the restaurant — a less bitter, more self-promotional ringer for Amy Wong’s mother from Futurama — sat next to our table and chatted with us for a spell, encouraging us to share our food with each other and to visit her other Han Dynasties, the third of which had recently opened in Royersford, wherever that was. Shortly after 9 p.m. she returned to our table as a warning that it was almost closing time, and/or as an implied threat that if we didn’t leave, we would have to add her as a Facebook friend. We took the hint, said our farewells both to our friend and to Mrs. Dynasty, zipped briefly through the nearest McDonald’s drive-thru to pick up some conciliatory McNuggets for my son, and returned to our hotel, sorry for the day’s disappointments but content with the parts I managed not to screw up, especially the part where we had the wondrous opportunity to enjoy great company. That night on TV: TBS’ regular Tuesday night block of The Office, a show about a man who imagines himself a competent leader, whose minions endure his painful shenanigans for want of an inspiring alternative. 1. I’ve chosen to play cagey with our friend’s personal details because not long after this trip, she began noticeably retracting her online presence and all but disappeared from my daily stops, for reasons unknown to us and ultimately none of our business. I’ve only recently made limited contact with her again, but it didn’t yet feel appropriate to bug her about something like this. 2. I just realized Anne’s shirt is a major spoiler for our 2009 road trip, which I haven’t reprinted yet on MCC. Whoops!